The heart of the game is a pile of objective cards which can be completed for special powers or victory points. Every objective card has different combination of symbols that you must occupy with legionnaire meeple to complete the them. A turn starts out by one player drawing a chip from a bag. All players then simultaneously may place a legionnaire meeple on a symbol on one of their own objective cards corresponding the symbol on the drawn chip. When a objective card has legionnaire meeples on every symbol, it is completed and it moves you your completed goals area. There they provide the player with a particular bonus. These can be immediate bonuses, permanent bonuses or end-game bonuses. In addition to the bonuses the objective cards provide, players also compete for rewards. There are three types: resource rewards, objective quantity rewards and objective set rewards. These are all victory point related and always involve some sort of set collection. 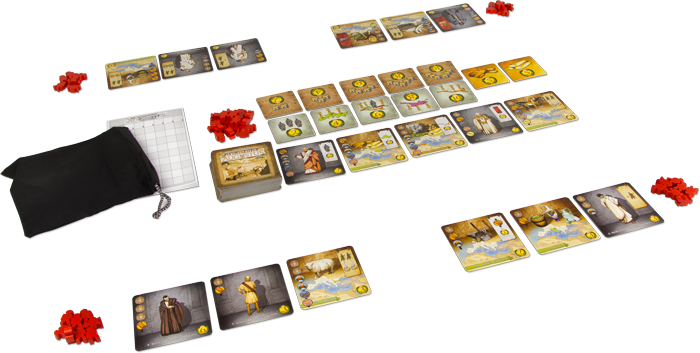 For instance the resource rewards works like this; the player with the majority in gold or wheat on their objective cards gains the corresponding tile which grants him/her 5 points. After completing an objective card players chooses a new objective card from the face-up supply. Once a player completes seven objective cards the game ends. The player who has the most victory points from their rewards, objective cards and bonuses wins the game. So the game plays fine, but somehow I feel like there is something missing. Maybe because there are pictures on the objective cards similar to the gold and wheat that are not used in the gameplay. This suggests an expansion of some sort is to be expected to utilize these pictures, but like I said the game plays fine ignoring them. So yes the game resolves the basic concepts of bingo and therefor luck does play a larger role than some gamers would like. On the other hand, it is an original game mechanic and is very easy to teach and play. When drawing chips from the bag you must understand that the symbols on the chips are not evenly distributed, so some symbols turn up frequently and some hardly show up. This is what makes the more powerful objective cards harder to complete, but also creates opportunities for strategy. You might pick easy objectives to race quickly to finish your seven objective cards or you can go for the difficult but high reward objective cards which are harder to complete due to symbols on that objective card that do not occur frequently on the chips in the bag. Alas it is still very much possible the symbols you are looking for just don’t get pulled from the bag. However this is mitigated somewhat by the objective cards that let you substitute one symbol for an other, making completing future objective cards more easy. I grabbed a cheap copy of the game because of the unique twist on bingo and I haven’t regretted it. It is a nice filler which I would happily play regularly. 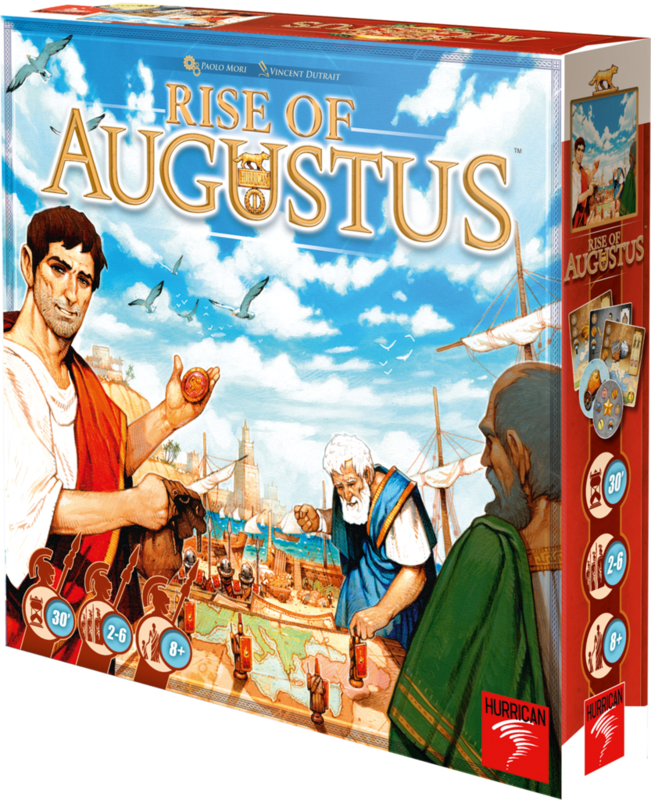 Augustus is a very lite game with some choices to be made. The concept of bingo is familiar to a lot of people so this should be advantageous when teaching the game. I had people make the remark after a couple of minutes in the game; Is this it? And yes, drawing chips and matching them with the symbols on your objective cards is all you do. The meat of the game is solely selecting the right objective cards and moving you legionnaire meeples to complete them.